Other than legal representation, Pixel IP's goals include general education of the public regarding copyright law and licensing practices. In pursuit of that goal, Evan Andersen has presented to corporate offices and professional associations alike, teaching content creators what they need to know to protect their rights, and end-users what they need to do to reduce legal exposure. The World Wide Web is a double edged sword. It provides content creators with greater professional avenues, opportunities, and exposure than were possible just 20 years ago. But those benefits come with a great risk. The ease-of-access combined with a general public that often either misunderstands or seems not to care about the rights of content creators constantly jeopardizes the ability of creators to control what they worked so hard to create. So what can content creators do to take advantage of all of the benefits of the Internet while minimizing risk? They can take advantage of tools – both technological and legal – to dissuade infringement, control distribution, and guide end-users to license the works and ultimately use them as intended. But just as important as knowing about these tools is knowing how and why to use them. If you think that you and your association, group, or company would benefit from learning about these tools and discussing copyright law, licensing, and how they apply to a business model, please contact Pixel IP at this page so that we may discuss opportunities for Evan Andersen to present. 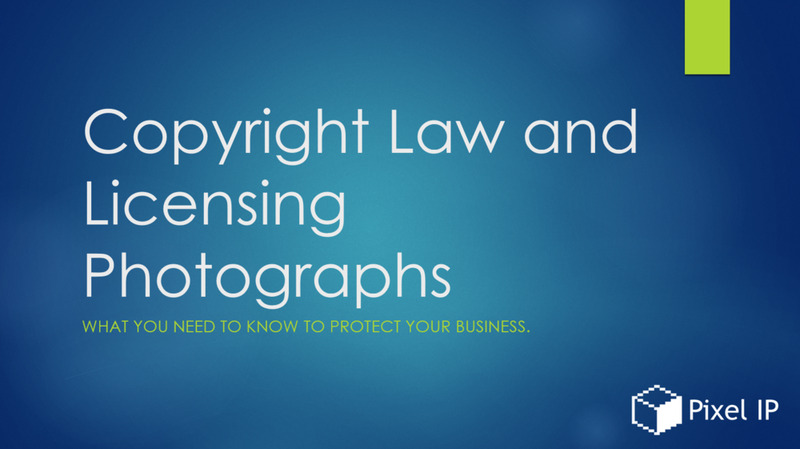 While your company may not be in the business of creating artistic works to license to others, it almost certainly deals with copyright and licensing issues through marketing, advertising, or social media. Even if – and maybe particularly if -- you hire a third party to manage any of these aspects of your business, it is critical that you understand both what is coming into your company through the media pipeline and what is going out. Liability for a mistake in that process can attach to your company, even without knowledge of or intent regarding the issue. So what can end users do to minimize legal exposure for these day-to-day practices? They can learn about what practices are allowed as compared to those that are legally out-of-bounds. They can educate their employees or third party agents. And they can create a system to obtain, maintain, and use content appropriately. Because when everybody involved with media of any kind knows the legal difference between the terms Rights-Managed, Creative Commons, and public domain, the risk of mishandling any works with those terms is drastically reduced. If you think that your company would benefit from learning about these practices, or would like to be proactive about reducing the risk of liability for these common mistakes, please contact Pixel IP at this page so that we may discuss opportunities for Evan Andersen to present.